Needless to say, we're a little bit behind schedule. We expected to be painting the frame this weekend. Now we're just hoping to paint it this year. 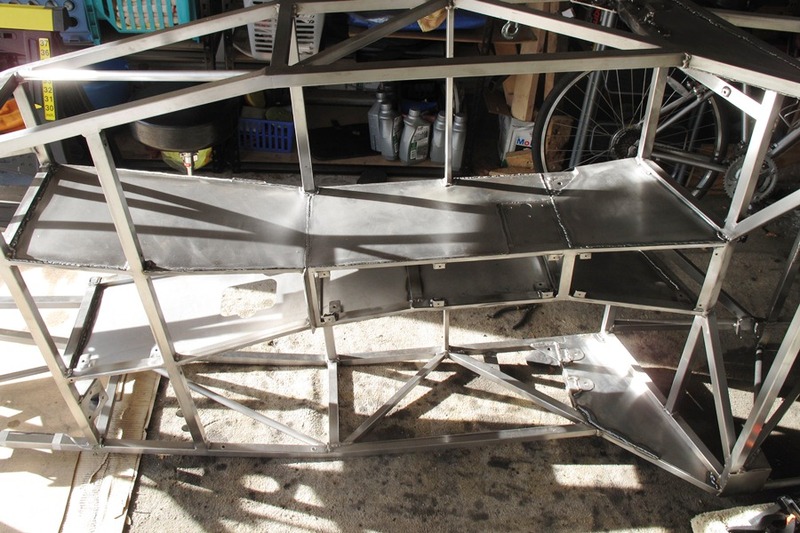 We have another six panels to weld, two of which still need to be made because we couldn't test fit them with the engine in the car, so we didn't bother to cut them out. We still have way too much welding to do even after all the panels are in place, because we're not done welding all of our stupid tabs and oh, by the way, we're getting a little tired of making those, too. 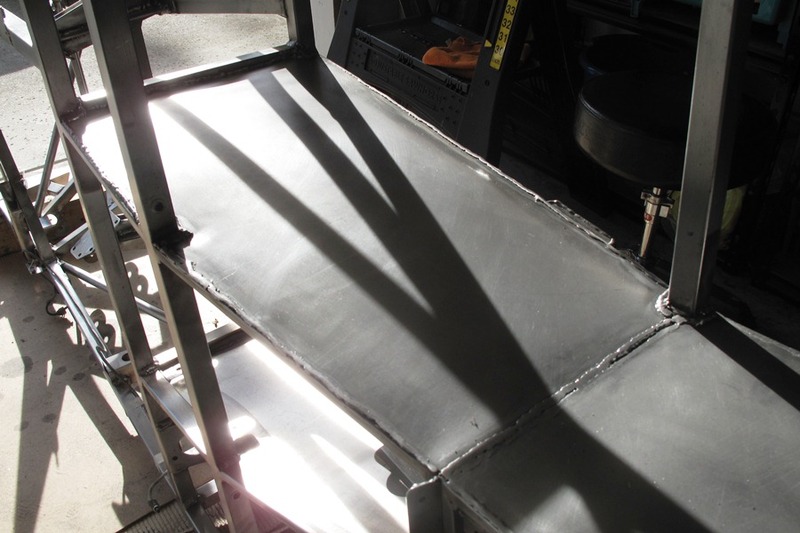 Each sheet metal panel takes about two hours to weld in place. First you have to position the panel properly, then you have to grind away some more clearance because you only thought you fit it correctly when you first cut it out. 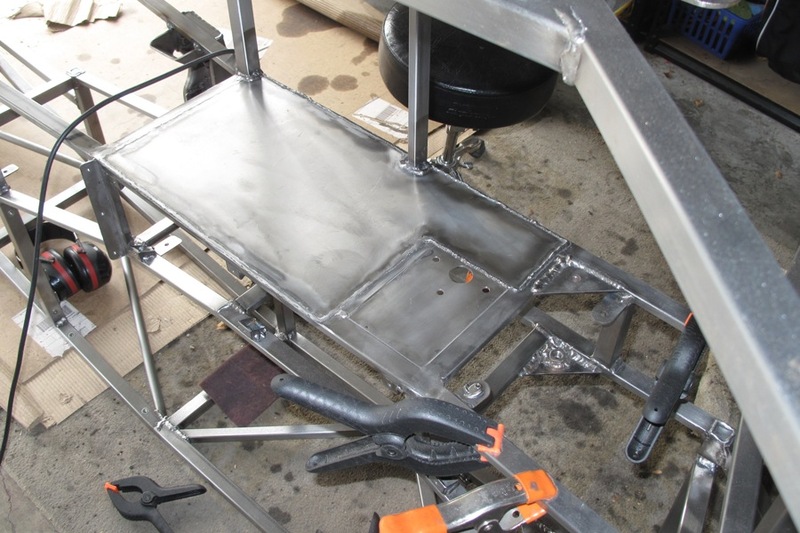 Then you have to move around the car, welding the edges about 3-4 inches at a time, spacing the welds so the panel doesn't warp uncontrollably, all the while making sure your plastic clamps don't melt to the panel. 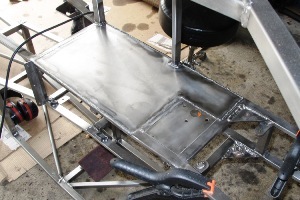 Then, after welding, you have to grind down the beads wherever someone in the passenger seat might see them, and finally, you have to file and sand the metal smooth again. None of the panels warped uncontrollably, but they all warped. This typically resulted in a slight bulge in the panel. The worst case, the passenger footwell, has only about a 1/4" bulge, but the good news is that you can take a photograph from just about any angle and it doesn't show. The bulges also have a kind of stabilizing effect. The panels are stiff as a board. You can push on them all you want and they won't move even a fraction of a millimeter. They feel more like 1/8" steel plate, which is great. We still wish they were flat, though. We might've been a little harsh on our Millermatic 140 welder earlier, when we blamed all the arc dancing and wire spatter we were getting on high current settings and thin wire. The other night we were welding 20 gauge sheet metal at a nice, low setting of 3, and we were still having arc issues, until about 30 minutes in when we heard this loud bang from the machine. We opened it up and the big plastic retainer for the wire spool was lying in the bottom of the box. You don't have to know a lot about welders to figure out it probably doesn't belong there. 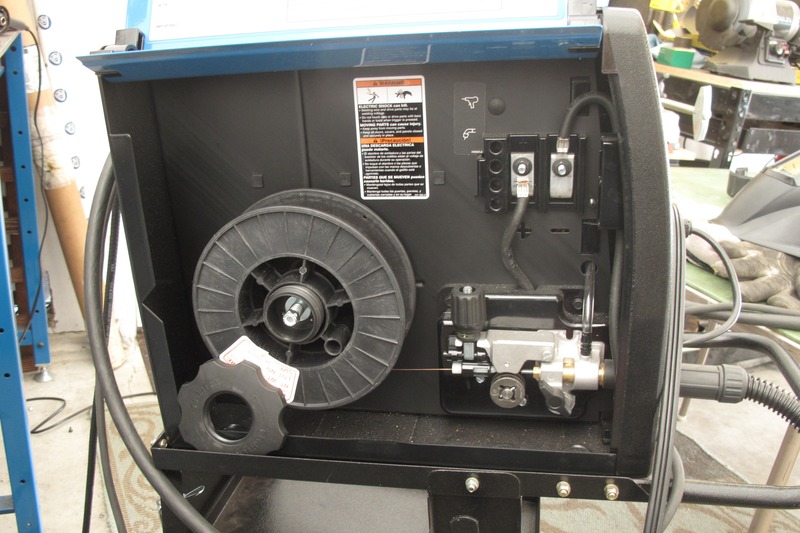 To get a stable arc, the wire has to come out of the machine smoothly and at a constant speed. If the wire speed is jerky, the arc will be too, and that'll cause spatter as melting wire droplets hit cold spots on the metal instead of the puddle, and then bounce away and attach themselves to other parts of the work. 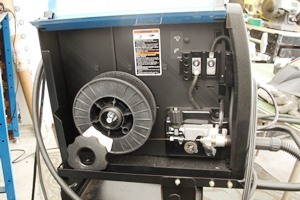 To make sure the wire speed is constant, the wire spool is kept under tension by a friction mechanism built into the spool holder, a mechanism that depends on the plastic retainer being screwed on tight. We're not sure who tightened the retainer last (okay, we are, but we're not saying. Okay, it was me.) and we're not sure how long the wire spool had been free to rotate on its own, but about two weeks would be a safe bet, because that's when we started noticing the problem. On the plus side, we've been meticulous about making sure we thoroughly cleaned our welds and had plenty of shielding gas, because either of those could've been the problem, too. And it's all fixed now, although in the end we'll have to live with our ugly, spatter-infested motor mounts. At least our sheet metal panels will look good. Well, not good of course, but as good as we can make them. And they're solid, having taken all the springiness out of the chassis, at least longitudinally. The floor should help even more, assuming we can get it cut out and welded in place without destroying our work to date. In any case we're happy to be welding the floor rather than riveting it on. It'll reinforce some our earliest welds, and give the car that carved-from-a-single-piece feel that makes riveted floors so jealous. In the meantime, we're about to mark a major milestone in our build plan. When we first wrote our build plan web page, it calculated a completion date sometime in March of 2014. The page figures out the date based on how many hours we've worked each week, on average, and the number of hours remaining in the project. As our hours per week has steadily increased, we've watched this date move back through February, January, and then into December of 2013. Two weeks ago it moved into November. Now, sometime this week, our estimated completion date will be less than a year away. Srygl5 Thanks for the blog post.Much thanks again. Awesome.